Well, Littletractorgal has been working hard on canning and pickling, and doing up huge posts for HER blog about what she does for canning… And I’m starting to feel a bit, um, left out here… So…. 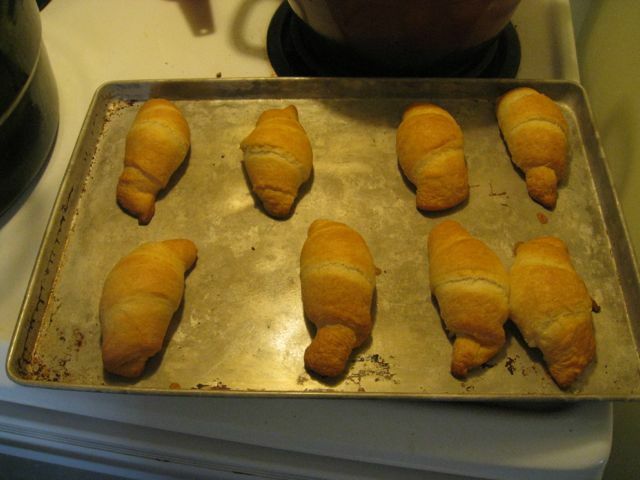 Step 3 – Assemble the pre-perforated triangles of dough into the rolled up crescent rolls on the baking sheet. Sorry, I don’t have pictures of this crucial assembly step, as, again, I forgot to start taking pictures… But some advice I CAN give you is – Start rolling them from the wide end! This is very important! 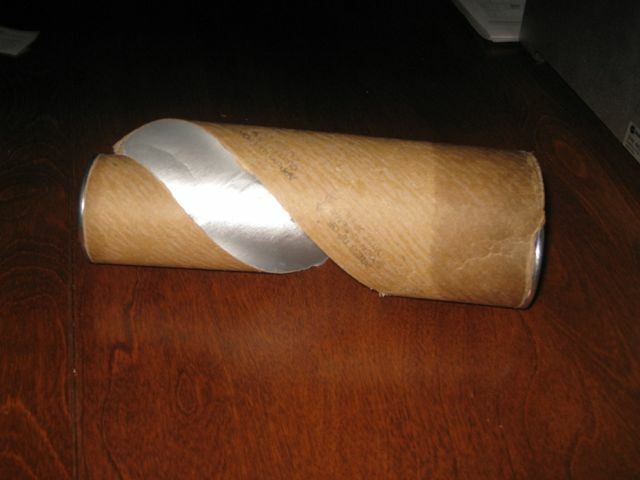 ADVANCED STEPS – At this point, once you’ve been through the whole process a couple of times, you can start doing some customization to the rolls. 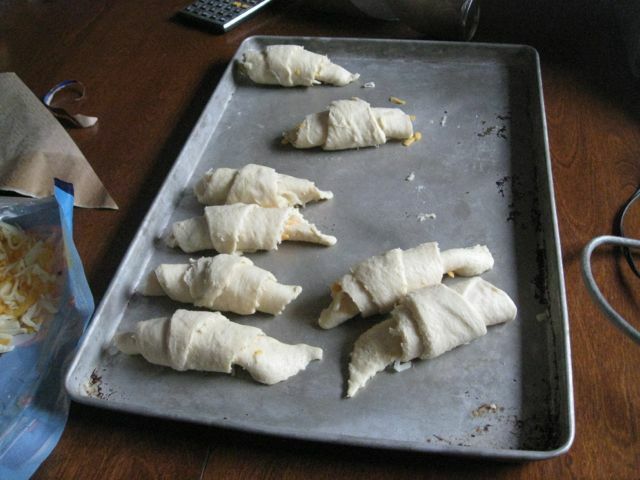 For example, one family favorite is to place grated cheese on top of the raw dough and roll it in, to make CHEESY rolls! IMPORTANT NOTE – the rolls do NOT hold a lot of cheese, so be aware of how much is being added. Step 4 – Bake the rolls in the oven at 375 degrees for 11-13 minutes. The amount of time is a subject of heated debate, as some family members like the rolls a little gooey in the middle and some don’t. Careful trials and experimentation is required to find the perfect baking time. This may also vary by oven, so your mileage may vary. 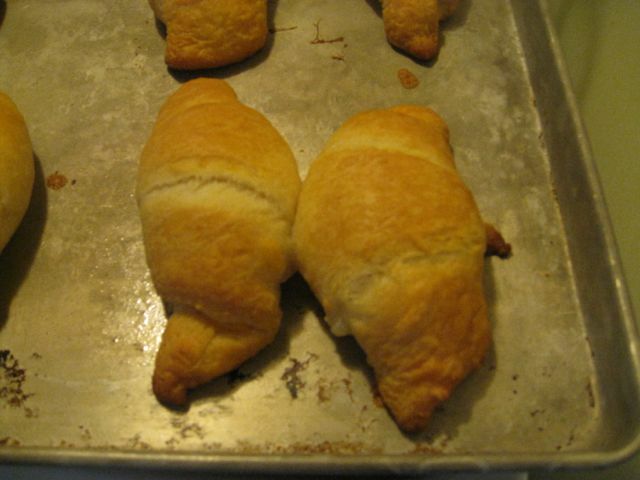 Step 5 – Remove from oven. This is a VERY IMPORTANT STEP! Viola! (That’s French again…) The finished, delicious product! Enjoy with spreads such as margarine, or (if you’re feeling up-scale) jam!! 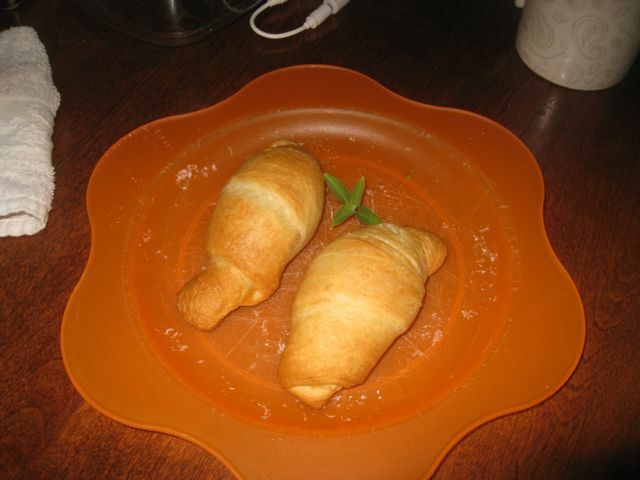 This entry was posted in Man-Food By Littletractorguy and tagged crescent rolls, man-food. Bookmark the permalink. You forgot step 6: Turn off the oven.